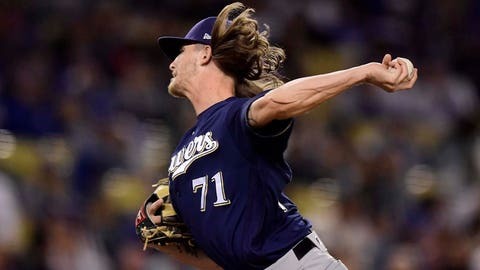 It seemed Milwaukee Brewers reliever Josh Hader was always breaking records or riding a new ridiculous hot streak last season during his coming-out party in 2018. Well, Hader is doing it again in 2019. In six appearances this season (nine innings), the 25-year-old left-hander has allowed a mere three hits and zero runs while fanning 15 hitters and walking two. The nine innings without giving up a run extended his scoreless streak from 2018, when he held opponents off the scoreboard in his final 12 1/3 innings on the hill, including 10 scoreless postseason frames. The last run scored off Hader was a two-run shot by Detroit infielder Dawel Lugo in the eighth inning of Milwaukee’s 6-5 win over the Tigers on Sept. 28. That’s 199 days, 14 appearances and 21 1/3 innings pitched without giving up an earned run. It’s the longest such streak going in Major League Baseball. It should come as no surprise that Hader owns the National League’s top ERA among young pitchers who started the 2019 season at age 24 or younger. Joining Hader on that list is St. Louis starting pitcher Dakota Hudson, who the Brewers will face Monday night. Hudson hasn’t allowed a run since Milwaukee tagged him for seven hits and three runs in 4 1/3 innings pitched during the Brewers’ 4-2 win on March 30. — After 16 games in this young 2019 season, the Brewers are 10-6 and hold a half-game lead in the National League Central Division. Last year, Milwaukee was 8-8 and 3.5 games out of first place. — Milwaukee and St. Louis are two of five teams in the National League to have yet to be shut out this season. The Cardinals have the longest streak in baseball, going 29 games without a shutout, while Milwaukee has scored at least one run in 24 straight. — Expect a lot of homers in this series. After all, the two teams combined to hit 17 home runs in the four-game series to open the 2019 season. Since last season, the Brewers rank second in the NL with 245 homers, while the Cardinals come in at third (229). — Milwaukee has three starting pitchers in the NL’s top seven for K/9 — Corbin Burnes (13.2), Brandon Woodruff (12.0) and Freddy Peralta (11.9). — Lorenzo Cain is often praised for his stellar defense in center field, but an underrated piece of his game is his baserunning. Since last season, Cain ranks fourth in the NL with 33 steals.